This rug is amazing!! My son has spilled multiple drinks (sone being grape juice) on it and they clean right up! No stains and it doesn't soak in and stay. Prefect for a house with kids! Enjoy durability and style with this Safavieh basket weave sisal rug. This indoor natural fiber rug adds a touch of organic sophistication to any room of your home. 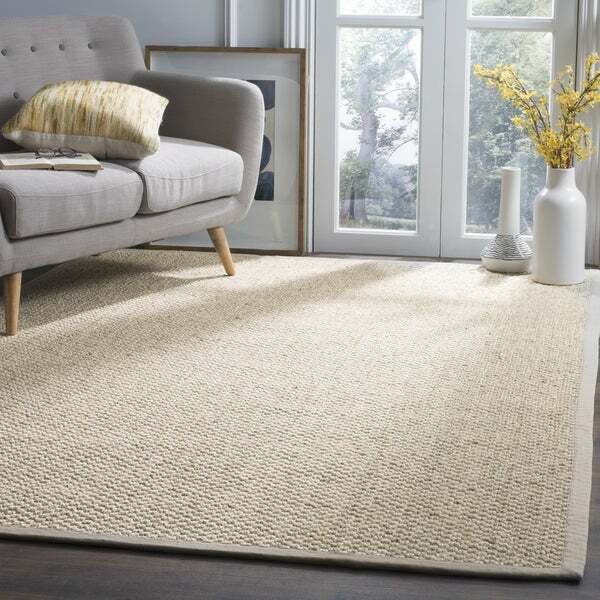 Inspired by coastal living and casual beach style, this sisal rug features power-loomed construction and an attractive basket weave design that imparts a pleasant appearance. The neutral marble color of this rug is perfect for pairing with a wide range of decor, while a fringeless border provides a clean aesthetic. Sporting a casual style and an attractive geometric pattern, this neutral rug provides the perfect carefree vibe to place among your existing furnishings. What a great find!! This rug more than meets my expectations. The weave is nice and tight plus the banding is top quality. I love the color which is not exactly the shade represented in the photo. It's more of a neutral beige ( not too light or dark). I would recommend this rug to anyone looking for a natural fiber rug. This is the first thing that I have ever bought from Overstock and they sent me the wrong two rugs. I ordered two of the Solid Natural/Ivory Sisal Rugs and received two Chunky Basketweave Marble Ivory/Taupe Sisal Rugs instead. The rugs are going in entryways. The rugs are darker and grayer than what is shown in the picture. I opened them because I thought that these rugs might actually work better in the entryways than the lighter ones that I ordered because they are still neutral in color and maybe they won't show as much dirt due to the chunky, tweed like color and texture in the weave which has some unevenness to it. However, even though brand new, the unevenness in color could appear as spots to some people, though I don't think that they are. I do not notice any smell like some people mention. Although the rugs feel coarse due to the sisal material, they still feel OK when I walk around the house with my socks on. The bottom line is that I'm not quite sure of what I think of the rugs yet, and I don' know how they will wear. 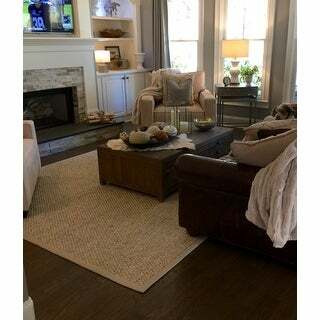 I'm working with an interior designer who did approve of the natural/ ivory sisal rugs, although she thought they would show dirt if someone's shoes are dirty. I am anxious to see what her response to this color and texture are. I find that sending things back is a bit of a pain. I'm glad that these are small rugs and didn't cost that much. I'll most likely use them for awhile, but next time I will buy something that I can see in person and know that I am getting what I actually picked. 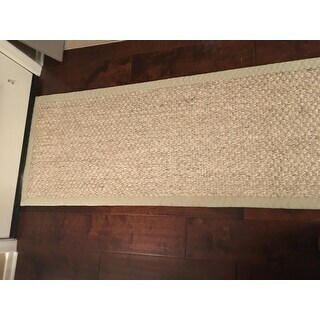 Purchased this rug for my home! It is everything it's rating indicates. Perfect ivory gray tones. Ordering another for my dining room to compliment my glam farmhouse decor! This rug is softer than most jute rugs and easy on the feet! No need for a rug pad underneath. 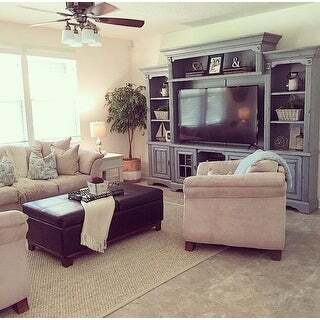 Such a beautiful washed color and is great for any room of the home. The neutral tones of this rug are perfect for casual,coastal vibe in a room. Just enough texture to the weave. Very little shedding. I purchased the 2x3 of this rug and it's just lovely. It's a little rough but sturdy and durable, and such nice quality that I love the feeling of my bare feet. I have since purchased the 5x8 for my dining area. Love the color of this rug! Kind of an ivory with slight gray tone. Very neutral. It’s perfect for our high traffic area over our new wood floors. It’s soft, but doesn’t shed. No smell or debris like other natural fiber rugs we’ve seen. It’s a great addition our family room. I recommend a pad to help keep it in place. This rug is perfect for my entryway. I was wanting something lighter, and I really like the chunky weave. It is really soft to stand on. This rug does have a rubber backing. I have been on the hunt for a perfect dining room rug and this one fit the bill! Great price and quality. 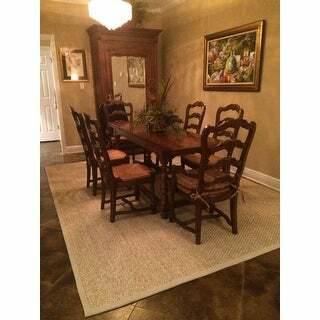 The rug is soft for being a sisal rug and looks really nice in my semi-casual dining room. Couldn't be happier and wish I'd found it sooner! The rug has a rubber backing so I didn't use a rug pad and it's working out well. Highly recommended. This rug is extremely well-made and is comparable to the higher-end carpets I'd originally considered purchasing. I love the chunky weave, which gives it a luscious look and feel. The color is true to what is seen on the site, a "greige" tone that works with practically any color scheme. I'm very happy with my purchase! This is beautiful rug! I’m into the natural look and it brightens the room and creates the look I want. The binding is a light grey hue that would enable a blend with grey walls or decor. No need for under stabilizing because it has its own nonskid backing. I love it! Rug has latex backing, so rug pad is not required. It looks so good in our bedroom I had to order another for our living room. Great price for this rug. The only negative thing I can say is that it isn't "as" soft as I was hoping for. I used it for under my dinning table, so it has worked perfectly for style, easy clean up, and resting your feet on it as you are sitting to eat. You just don't want to be rubbing your feet side to side on it because that is when you feel the rough texture. I wouldn't suggest its use as a living room carpet. 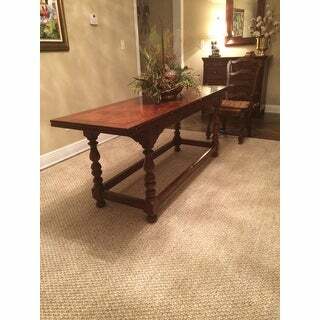 Great for dinning room or mud room. The rug itself is great, and what I expected. The only problem is because of the weave, it’s very hard for it to get clean after you start using it. We have 2 dogs and their hair gets stuck in the fibers of the carpet and it’s impossible to get out. Even with a good vacuum. Looks great - has grip so it's stays put. Exactly what I wanted. love, love, love this rug!!!! It is so versatile and can go anywhere. It cleans up easily and the kitties cannot tear the threads out! It was ok. Not what i was looking for. Goes well under our dining room table. 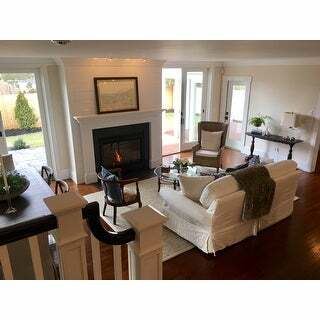 This rug looks terrific in our porch! It's color is very neutral and so it goes with any bright color I use or it blends with more earthy colors. It wears well and is durable. Not scratchy underfoot either! I've always been into natural fiber rugs; but usually the photo doesn't accurately depict the color. 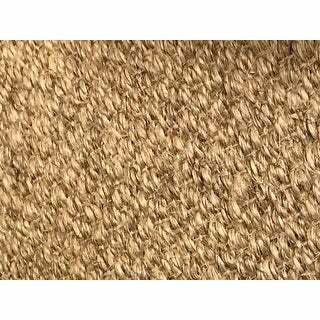 I like lighter color jute or sisal, and usually when it arrives , it is dark, or orangey, or green. This is perfect. 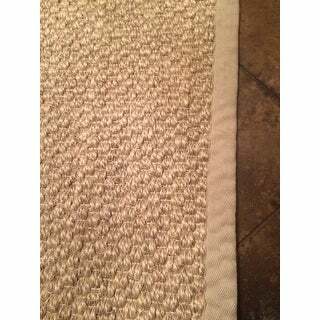 Very light sisal....the binding matches...I wouldn't call it taupe as in the description....it is more light tan. It pretty much matches the jute. Perfect for an airy look....if that's what you're going for. Also, I have dogs, which is another reason I choose these rugs. Very happy. Really like to rug. It is as described. "How tough is it to clean this rug? It has a lot of great reviews, but no one seems to mention having pets. If my cat vomits on this rug, is it all over with?" "How hard is it to scoot a dining room chair over this rug? :)"
This is case specific, there are other variables that will effect this. "Is the size 8x10 or 8x11. It makes a difference for my space. I need no bigger than 8x10. The size choice is 8x10-8x11. Which one is it?" The size of this rug is 8' x 11'. Please note sizes may vary up to a couple of inches. "What is the best method to clean this rug? Also, this rug is not soft and if you walk on it with bare feet it will injure your feet"
"Can Scotchguard be applied to this rug?" "If you spill water on this rug , will it stain/leave water marks?" Prolonged or excessive exposure to water would damage a natural fiber rug. Any spills should be dried immediately to prevent damage. 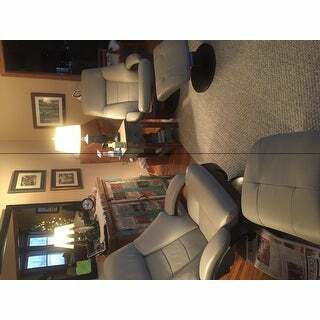 "I love this rug and am thinking about buying two for an outdoor living area. It is a covered area, but still outside. Are these good to use outside?" This rug is not made for outdoor use.